Best Headphones Deals: Grab one of these cheap headphones deals and transform your portable audio experience. Buying a decent set of headphones can be a truly revelatory experience. In one fell swoop, all of the music that you stream (or your entire music collection if you’re old school) sounds better. You start picking out sonic details that were previously hidden from your ears. How do you know if you need a new set of headphones, though? It’s tricky to say for certain, but one safe rule of thumb is that if you’re still using the earphones that came with your smartphone, you should upgrade as soon as you can. It doesn’t matter how stylish those little bits of plastic look or feel, they’re almost universally inferior to a well sourced third party alternative. And you don’t even need to pay the Earth to make a meaningful improvement to your listening experience. From super-portable Bluetooth earbuds to chunky over-ear home listening headphones, the headphones market is more vibrantly varied than it’s ever been. Thankfully, you can get real quality right across the price spectrum. We’re here to help you pick out some of the best headphones deals in the UK. Whatever type you’re after, and whatever your budget, there should be something for you in the following round-up. All prices were correct at the time of publication, but do tend to change quickly. Act fast if you want to snap up a bargain. They look great, sound fantastic and now with a lower price they’re an absolute bargain. There’s two levels of noise cancelling and you can tweak the sound to your liking with a companion app. Or if you have a bigger budget, go for these sports headphones that deliver trademark Bose sound quality. Buy these punchy wireless headphones, and you can get a pair of Beats by Dre Powerbeats 3 in-ear wireless earphones (worth £149.95) for free. One of the best parts about buying from John Lewis is its excellent 2-year guarantee on headphones. This premium gaming headset has been reduced to clear at John Lewis. They feature extra large memory-foam padded ear pads and a noise-cancelling microphone. These smart wireless Bluetooth earphones are currently reduced to clear at John Lewis – but you get the same 2 year guarantee. Get a third off these already-affordable wireless, waterproof earphones. Ideal for runners. If you’re after a pair of headphones you should be crystal clear what type you want, as the come in a number of different shapes and sizes. First you need to consider form factor. Over ear headphones can offer fantastic audio quality and the best noise isolation, but they’re pretty chunky as a result. On ears are a little smaller but offer less impressive noise isolation, so if you’re walking around London or in an office you’ll still hear a lot of background noise. In-ear are the most discrete option and are the form factor most people opt for. Then you need to consider what you want them for. If you’re after a pair to use in the office or while traveling, you’ll want a set with ANC (active noise cancelling) which will help block out background noise, like the hum of an engine. If you want to use them in the gym, you’ll want to invest in a sports set with sweat resistance and wing or clip tips. If you plan to use them with your phone, given how few modern handsets have a 3.5mm jack, you’ll probably want to think about going wireless. After all that you’ll want to think about price. As a rule of thumb headphones are an area where you get what you pay for, so if you care about audio quality it’s always worth investing a little bit more. The difference between some £70 and £100 sets is palpable. Stay up to date with all the latest offers by following us @TrustedDealsUK. 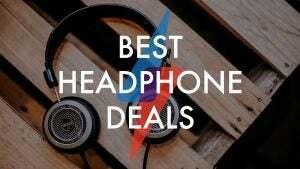 The post Best Headphones Deals for February 2019: Cheap wireless headphones and more appeared first on Trusted Reviews.